The July 23, 2014 WSJ article “Mission to Purge Syria of Chemical Weapons Comes Up Short” offers an extremely worrying picture about the international operation led by the Organization for the Prohibition of Chemical Weapons (OPCW) for the dismantling of Syria’s chemical arsenal. According to the WSJ, earlier this year, American intelligence agencies tracked the regime’s increasing use of chlorine-filled bombs and the production of more effective such bombs by Syria’s scientists. It is odd these agencies arrived so late at this conclusion while the international media published ample information about the regime use of chlorine during spring 2014. At the time, this author evaluated that the Assad regime decided to use minor chemical attacks with chlorine (less lethal and impressive than mustard gas or sarin) in order to win tactical battles in strategic areas - the Damascus neighborhoods and north-western Syria. Contrary to its initial evaluation that Assad destroyed all of the chemical weapons it possessed, in recent weeks the CIA “concluded that the intelligence picture had changed and that there was a growing body of evidence Mr. Assad kept caches of banned chemicals.” The U.S. intelligence suggests that Assad may be prepared to use chemical weapons if government strongholds (like Aleppo or Latakia) are threatened by Islamist fighters. 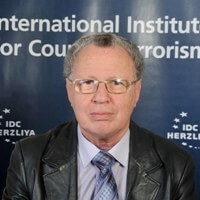 This evaluation was presented by this author in the aftermath of the signing of the U.S.-Russian agreement in September 2013 as he was skeptical that a Syria still ruled by Bashar Assad and ever-conscious of the Alawite community's fragile future is ready to renounce its entire chemical arsenal as the Russian-American plan proposed. A comprehensive ICT Report “Syria's Chemical Weapons - The Terrorism Threat” detailing Syria’s chemical weapons capabilities was published days before the 14 September 2013 "Framework for Elimination of Syrian Chemical Weapons" agreement. The report evaluated that Syria had some 45 – 50 facilities and military bases involved in chemical warfare. Brigadier-General Zaher al-Saket, a former chemical weapons chief in the Syrian army’s 5th division who defected to the opposition to Assad in April 2013 offered intelligence that the Syrian president is evading the terms of a Russian-brokered deal to destroy the chemical weapons by transferring some of the stocks to his allies; Hezbollah, in Lebanon, and Iran. Gen. Saket warned of possible discrepancies between the 23 sites Syria had declared to the United Nations and its actual chemical arsenal. He said units under his command had moved chemical munitions between 32 different sites, but there were additional secret locations his forces did not deploy to, in all close to 45 sites. It should be noted that the international community already experienced Syrian propensity, although a signatory to the Treaty on the Non-Proliferation of Nuclear Weapons, in cheating about its WMD projects. After the bombing of the Deir-al-Zor North Korean-style plutonium reactor in 2007, allegedly by Israel, Damascus had done everything it could to destroy all traces of what had been going on there. IAEA inspectors who found suspicious uranium particles at the place requested access to three other facilities due to ongoing suspicions. Syria has refused repeated requests from the IAEA to inspect the site after the one and only inspection in June 2008. According to IAEA, Syria possesses up to 50 tons of natural uranium, enough material for three to five bombs once the enrichment procedure is completed. Assad regime’s enhanced use of chemical weapons emboldens rebel and terrorist groups in Syrian to use the same methods. ISIS took control in 2014 of the huge Iraqi Muthanna chemical base in June 2014. Although the U.S. State Department played down the importance of the capture suggesting that the facility contained "degraded chemical remnants...difficult, if not impossible, to safely use for military purposes,” a CIA report from 2007 asserted that the precursor and agent production area at the complex was not completely destroyed during Desert Storm, portions of the mustard production and storage area survived and the precise nature of munitions stockpiles at the site remains unconfirmed. Islamic State forces did employ some form of chemical agent, probably mustard gas, for the first time in July 2014 against the Kurdish Peoples' Protection Units (YPG) forces and civilians in Kobani. The Kurdistan Region Security Council claimed that IS used chlorine in a January 23, 2015 suicide truck bomb attack against peshmerga forces in northern Iraq. Lately it appears the Islamic State manufactured rudimentary chemical warfare shells and attacked Kurdish positions in Iraq and Syria with them as many as three times. If this is the record of the international community in dismantling and monitoring the chemical and nuclear facilities in Syria, how exactly it will do better in monitoring the vast Iranian nuclear infrastructure? Would indeed Iran, the cat guarding the milk, be responsible for collecting its own soil samples from suspected nuclear sites to turn over to the IAEA for inspection, as exposed during the public hearing in the U.S. Senate?